Summer is finally here and the barbecue season is on Are you ready to use the grill? Today’s recipe is a “fish” burger with hard bread instead of burger bread. 1. 1 avocado, halved, pitted, peeled, and diced medium. 2. 1 ripe mango, peeled, pitted, and diced medium. 3. Pour juice from half a lemon over the avocado and mango. Add salt. 1. Chop cilantro and mint. 2. mix it with 2 dl of vegan sour cream. Add agave syrup, salt, and chili powder. Curious for more vegan BBQ tips? Check out this article! 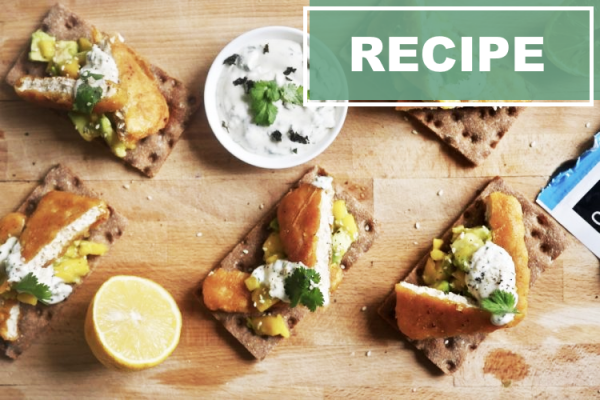 Or do you want to see more fishless-style recipes? We have some for you here, here and here. Which ones are your favourites?